Bruce is a third generation Southern Californian. 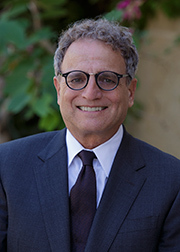 After first practicing law in Los Angeles, Bruce and his wife, Denise, moved to Santa Barbara in 1990 and joined Griffith & Thornburgh. His expertise in family law was nurtured by his earlier work as a family therapist and his degree in clinical social work. He and Denise live with their son, Spencer, two dogs, a cat, and six chickens. In his spare time, Bruce enjoys barbequing, gardening, golf, and travel. He is also an ardent follower of UCLA Bruin basketball and football. Personal Injury Law – Defense and prosecution of serious injury and death claims. Recipient of American Jurisprudence Awards in: Products Liabilities, Ethics, Negotiations and Counseling.